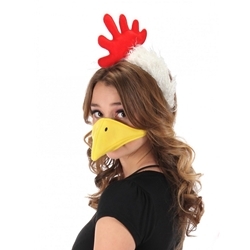 The Chicken Kit includes Plush Headband and Beak with Adjustable Band as pictured. Don’t sit around and lay an egg, put on the Chicken Kit and cluck to your heart’s content! Perfect for school plays and musicals, Halloween, or for everyday dress up fun!